In this event, we will be exploring Bias in Machine Learning. We will look at the present day challenges as well as the best methods we have for addressing these problems.For example - Today, women only form around 17% of tech jobs, and just 10% are working directly with AI. We can fairly assume this will create a bias in AI towards male values. When I created this cover picture (previously for a blog), without thinking it ended up being a man shaking hands with a machine in his image. 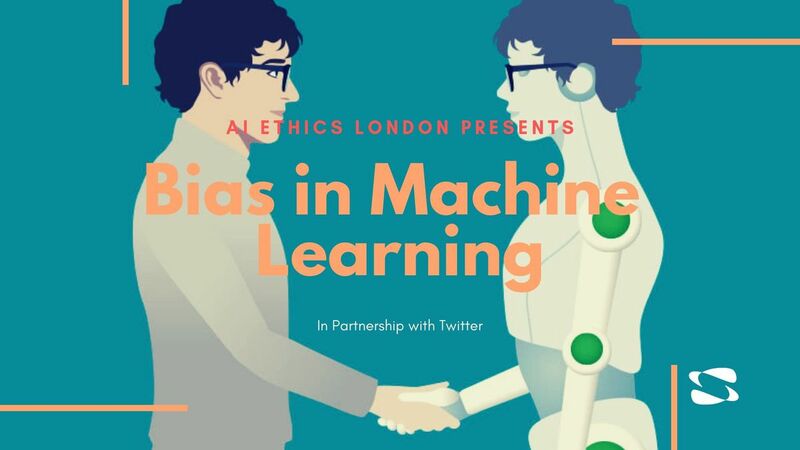 Hardly an inclusive image, and a bias that I would like to correct.The problems with bias are amplified when we consider AI and automation - Potentially enabling our bias to be carried out orders of magnitude faster than humans could alone, and abstracting humans from the ethical responsibility of these actions.Huge thanks to Twitter and Sorpa Steria for sponsoring this event. Please sign up with your full name - We need to provide this information to the venue for security reasons.